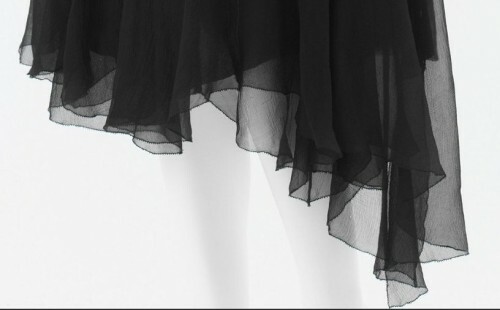 Terminology: What is a picot hem? 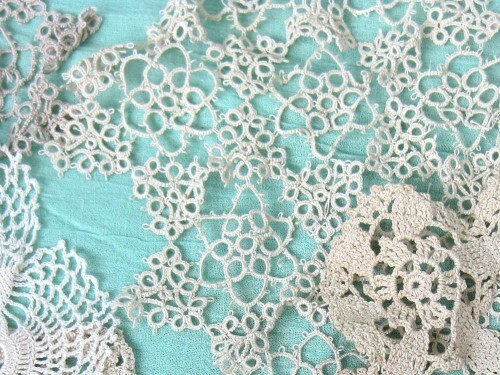 If you are a really dedicated crafter, you might even know the same term from tatting (which is characterised by its use of picots), or know that some types of lace commonly use picots. 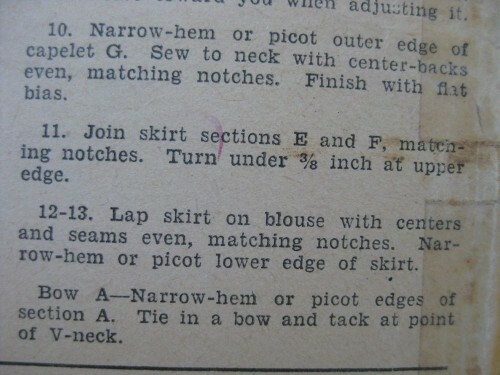 Picot edges are less well known in sewing these days, but you should, because 1) they are awesome, and 2) they are a common sewing technique in the 1920s and 30s, worked both by machine, and by hand. In sewing, a picot edge is a rolled hem with a zig zag stitch sewn over the hem to hold it. It is usually worked on very fine, lightweight fabrics such as chiffon. 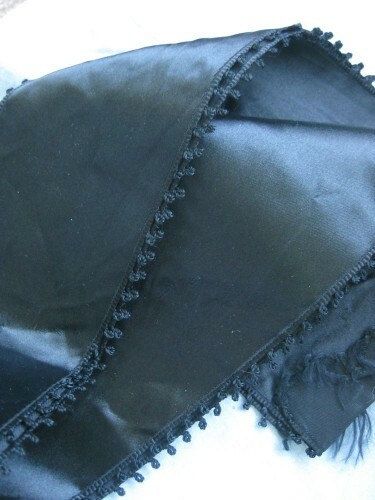 When I first saw a picot edge, I thought it must have been a very simple, cheap, low quality finish, such as overlocked hems on modern clothes. 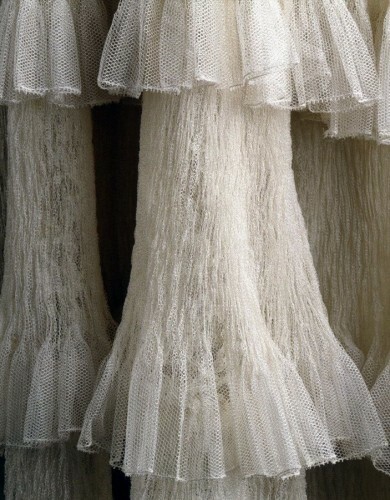 However when I interned at the Met I got to see Chanel dresses with picot hems – you can’t get much posher than that! 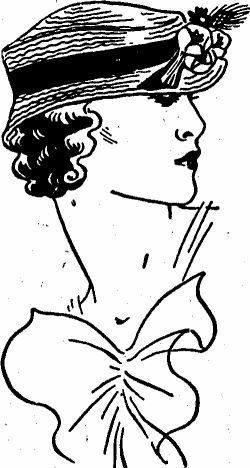 The use of picot edging for this type of hem seems to have arisen in the 1910s, with numerous retailers advertising picot edged scarves and collars. It wasn’t just for dresses though. 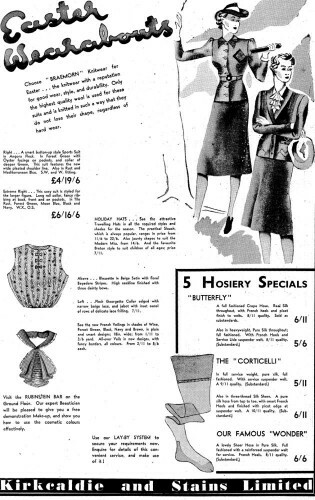 A 1935 advertisement extols the merits of ‘bungalow curtains‘ (how modern!) with picot edges. The technique was so common and popular in the 20s and 30s that the name picot was even applied to straw woven in small loops. You can also see usages where picot refers to a zig-zagged or looped seam join – not an edge at all. The earliest uses of picot (at least that I can find) are not for lace or crocheting, or knitting or hemming or straw at all, but for ribbon. Numerous advertisements from the 1880s market different types of picot ribbon, referring to ribbon finished on the edges with little loops. You can still buy picot edged ribbon, and it’s still sold under that name. I’ll add picot edging to my list of tutorials to-do, and hopefully it won’t be too long before I get to it! I LOVE picot hems! Thanks for all the lovely images. My husband gave me his grandmother’s picot hem sewing machine attachment. That thing is HEFTY! If I remember correctly it does two functions, but one is a picot hem if you cut down the center. Very interesting! Now I know what the heck those patterns are talking about! 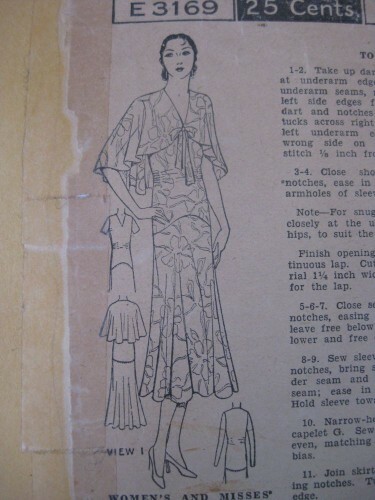 Nicely written and illustrated bit of modern sewing history! Very well done. Where do you get the images you use for your essays? Most of the images were taken by me or come from my personal collection, the others from NZ newspapers or from museums. This brings back memories of my one and only time as a bridesmaid to my sister in England in 1951. My mother made my dotted voile dress and bonnet on her trusty treadle. I believe she used a commercial service for the picot edging on the frills and fichu (the dress really was very pretty). The edging was made like ladder stitch insertion and cut through the centre to make the picot edge. Interesting. It looks like topkapi (the only spelling I can find it by) is a NZ term, and may have been a trade name for a ribbon and yarn company. The few places that use it these days show a ribbon with a raised border on each edge – not quite picots. I know! It makes social history research so difficult! I can find usages of all sorts of terms, but no-one explains WHAT the heck they meant by it! I’m familiar with picot and tatting because my mother inherited my great-grandmother’s tatted sheets and pillowcases, which she did by hand when she wasn’t busy raising five children or helping run a farm. I’ve always wanted to learn more about it, so thanks! Ooooh…lucky you! I love tatting – all those swirls! Alas, my tatted pieces are all op-shop finds, not family history. While I’m well acquainted with picots in beading and tatting, I’d never heard it before applied to sewing! But I realized after reading your description that it was the way my mother hemmed some lightweight scarves she made. I need to go peer at them and learn that! Picots in beading are a new one for me. Are they little bead loops along the edge? Have you been successful replicating the picot edge using a modern household sewing machine? I sew on a Husqvarna Viking Designer 1 and have tried to find a hemstitch that will work for the picot, but it just unravels when I cut down the center. Will I have to get a vintage machine to do this vintage stitch? Next PostPorcelainToy’s ‘Monsters’ Music Video – my screen debut as a costumer!